This first section of the Suncoaster Trail is 9 km long with moderately steep terrain. There is a fantastic view of Ruby Lake along the route. It can be broken down into three sub-sections, each approximately 3 kms long. The first section is from the Egmont Road parking area to Klein Lake. This has a fair amount of up and down and the trail goes from natural to gravel to larger rocks. You will pass by a pretty little unnamed lake along the way. The second section is the road around Klein Lake. When you come out to the road you will turn left and simply follow it all the way around the lake, passing all of the campsites. The third section is the nicest in my opinion and runs from the end of the road around the lake up and over to Sakinaw Lake Road. Along the way you will have an opportunity to have a seat on the homemade snowboard bench and drink in the view of Ruby Lake. Just beautiful! You can also check out the Iris Griffiths Interpretive Centre if you wish. Click on the map below to open a pdf version. 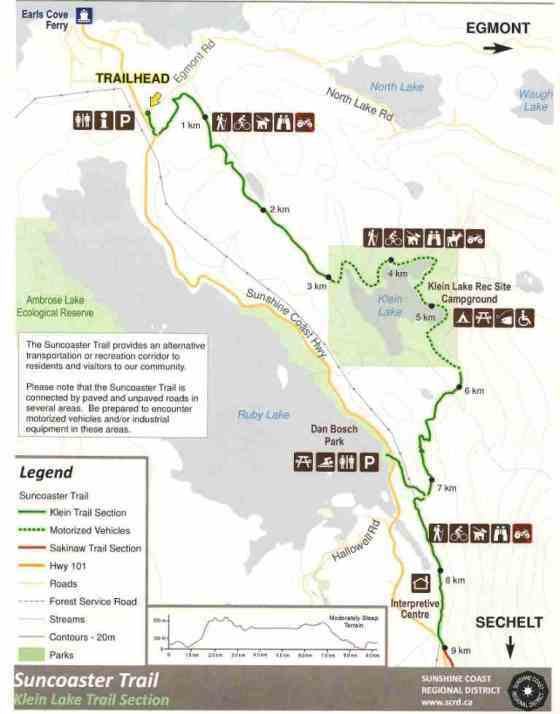 Click here to return from the Suncoaster Klein map to the Suncoaster Trail page.